1 O LORD, how my adversaries have increased! Many are rising up against me. 2Many are saying of my soul, "There is no deliverance for him in God." Selah. 3But You, O LORD, are a shield about me, My glory, and the One who lifts my head. 4I was crying to the LORD with my voice, And He answered me from His holy mountain. Selah. 5I lay down and slept; I awoke, for the LORD sustains me. 6I will not be afraid of ten thousands of people Who have set themselves against me round about 7Arise, O LORD; save me, O my God! For You have smitten all my enemies on the cheek; You have shattered the teeth of the wicked. 8 Salvation belongs to the LORD; Your blessing be upon Your people! Selah. Also David had to experience this, because he was anointed by God! As he complains: “O LORD, how my adversaries have increased! Many are rising up against me.” (v.1), - also his own son! It is not rare phenomenon that the highest seats are the most sought after. It is really a normal pattern, but David was also a target for hostility simply because of his relationship with God! We always meet this phenomenon - also in the new religious movements - among people who is not in a true relationship with God, that they always think that a good relationship with God, shows on the outside in earthly prosperity and progress. We so often hear when people have crisis and troubles in life, which is evident to all: “He who is a believer - why does not God help him out of his trouble?” Just think about the parable about Lazarus and the rich man; - first Jesus points to a person: “Now there was a rich man, and he habitually dressed in purple and fine linen, joyously living in splendor every day.” (Luk. 16:19). This is exactly how many Christians consider a life blessed by God! But hear how this man ends: “In Hades he lifted up his eyes, being in torment, and saw Abraham far away and Lazarus in his bosom.” (Luk. 16:23). In torment – and Abraham (heaven) far away! Yes he had lived his life far away from heaven, precisely because he had seen the joy in his earthly possessions! It had satisfied his soul, so that he did not seek anything else. And then we hear about the other person whom the rich man sees in Abraham’s bosom, namely in heaven: “And a poor man named Lazarus was laid at his gate, covered with sores,and longing to be fed with the crumbs which were falling from the rich man's table; besides, even the dogs were coming and licking his sores.” (Luk. 16:20-21). Can you imagine such existence! – Who would think that this man was the subject for God’s blessing! No, not until you read: "Now the poor man died and was carried away by the angels to Abraham's bosom; and the rich man also died and was buried.“ (Luk. 16:22). No, the natural mind could not grasp this, there had to be a revelation. What do you see? How do you think about these things? Are you like those whom David speak about in this Psalm: “Many are saying of my soul:” There is no deliverance for him in God." (v.2). They were thinking just as we mentioned - that if David was in a right relationship with God, and therefore under His blessing, this could never have happened to Him! They did not know Him, of whom it says: “For whom the Lord loves He disciplines, and He scourges every son ho He recieves“ (Hebr. 12:6), and which says: “Those whom I love, I reprove and discipline; therefore be zealous and repent.” (Rev. 3:19). They were thinking just the way the Pharisees did, concerning the blind at birth Jesus and His disciples ran into: “And His disciples asked Him, "Rabbi, who sinned, this man or his parents, that he would be born blind?“ (John 9:2). They are completely taken by the Pharisees doctrine! – A doctrine that Jesus completely rejects. We also find a good example about this in the Word, with Job’s friends who were convinced that Job had to suffer for his sins! In other words that it was God who was against him! But David is a true believer, which means one who knows God, so that he turns to the Lord with boldness right in the midst of this terrible situation! Despite what these unbelievers thought about it: “But You, O LORD, are a shield about me, My glory, and the One who lifts my head.” (v.3). Therefore, no matter what happens to me now, you remain the same towards me, because You are faithful! – You cannot deny Yourself! He testifies: “But you, O Lord, are a shield about me!” – Which preserves me! It is very good of him to say that, considering the situation he is in. Is it really this God you and I knows? We have to ask ourselves! Has the Gospel dawned to you, in your heart? That God is your friend, in Jesus Christ! – That God is a reconciled God, in Him! – That He now comes forth before you, like One who never will be angry with you! – As He testifies in Isaiah 54: “For this is like the days of Noah to Me, When I swore that the waters of Noah Would not flood the earth again; So I have sworn that I will not be angry with you Nor will I rebuke you.“ (v.9). Do you really hear what is being said here: “I have sworn,” He says, - and for what? That He will not be angry with you nor scold you! Has this dawned on you? And then He substantiates this: “For the mountains may be removed and the hills may shake, But My lovingkindness will not be removed from you, And My covenant of peace will not be shaken," Says the LORD who has compassion on you.“ (v.10). My Covenant of peace! The Lord will not depart from what happened one day on Golgotha! You say that you know the Lord! – Let us then hear if you know His name, He told you in the verse we just read; - Listen! : “He who has compassion over you!” Is not that a blessed name to know? Therefore David turned to the Lord with such boldness, because He knew the Lords true name, - he was a man after God’s own heart! (1 Ps. 13:14; Acts 13:22). “I was crying to the LORD with my voice, And He answered me from His holy mountain. Selah.” (v.4). He was crying to the Lord, he said. This was real need! Not just fear, which comes when you see death before your eyes, but a deep sorrow, because it was his son Absalom who was behind this, he whom David loved. - He says to his men, in spite of this riot, where Absalom wanted to take his life: “The king charged Joab and Abishai and Ittai, saying, "Deal gently for my sake with the young man Absalom." And all the people heard when the king charged all the commanders concerning Absalom.“ (2 Sam. 18:5). - And when Absalom is dead because of his own riot, not just against his dad, but also against God, we hear about and of David: “The king was deeply moved and went up to the chamber over the gate and wept. And thus he said as he walked, "O my son Absalom, my son, my son Absalom! Would I had died instead of you, O Absalom, my son, my son!" (2 Sam. 18:33). We see a hint of God’s love towards the fallen and rebellious mankind in this: “O, if I had died instad of you!” David speaks of one that he was a prototype for, the Messiah! It is Jesus desire from eternity: O, if I was dead in your place! – Instead of you! 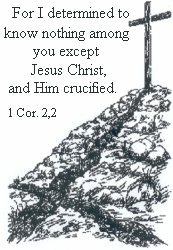 And it was exactly what He completed on Golgotha an appointed day in history. Are you a bold Christian? - You have at any rate all reason to be, you who have taken your refuge in Jesus!